clear GPS voice navigation, hands-free call and seamlessly switching between incoming calls and music. a crystal clear hands-free calling and safer driving. other 3.5mm AUX jack audio devices), all of them are pretty easy to switch via the multifunctional button. convenient to operate when you are driving. Dual USB PORT & SMART CHARGING - Bluetooth FM transmitter for car comes with 5V-2.4A and 5V-1A charging ports which output 3.4A total, support charging two devices simultaneously. Keep your devices full of energy anytime & anywhere! ANSWER CALLS HANDS-FREE - High-performance microphone with noise suppression (CVC) technology, grants you crystal clear call. Answering/redialing/dismissing or ending a call just simply click the button. Seamlessly switches between incoming calls and music; Drive more safely. LARGE LCD SCREEN: Developed with 1.4'' LCD screen to better show your phone calls, music, car battery voltage, FM frequency. Ideal sized screen to assist drivers without disturbing the experience while driving safely. Easy to read at night and daytime. WIDE COMPATIBILITY- Apply to a variety of vehicles of which voltage are 12-24V. 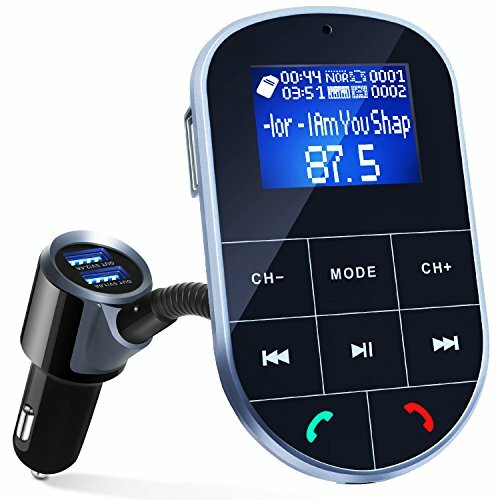 Bluetooth Car FM Transmitter can be paired as a hands-free kit with all Bluetooth enabled devices, such as iPhone, iPad, iPod, Tablet, Samsung, HTC, Sony and other Android smartphones; Meanwhile, It enables to read and play music in MP3/WMA format via USB flash disk, TF memory card and Aux cable audio. If you have any questions about this product by IMDEN, contact us by completing and submitting the form below. If you are looking for a specif part number, please include it with your message.